If your child is constantly glued to a tablet swiping away at birds or fruit, you're probably wistfully wishing for the days when kids liked playing with actual toys. Well, Lego just might have the perfect solution for you and your offspring. Today, the maker of the beloved construction bricks announced Lego Fusion, a system that combines the flexibility and fun of app-based games with the good ol' fashioned activity of creative Lego building. 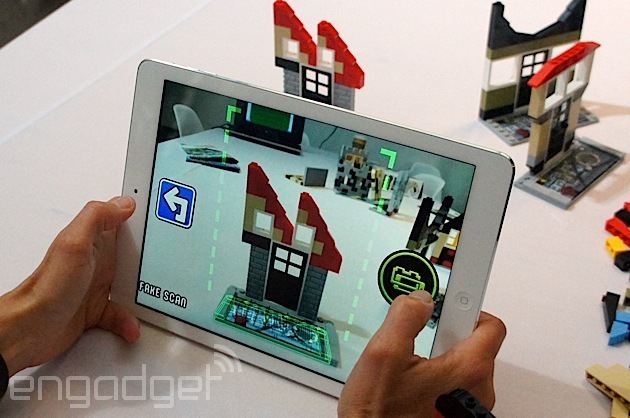 Developed by Lego's Future Lab, Fusion was invented as a way to marry digital and analog play. Ditte Bruun Pedersen, a senior design manager of the Lab, tells us that during its research, the Lego team discovered that children don't really differentiate physical play from digital. "To them, it's not two separate worlds. It's one world that blends together. It's all just play." However, games on tablets and phones remain popular with kids because of how immersive they are, so the trick is to put the two worlds together. The Lego folks identified three sorts of games that kids typically like: Tycooning, which involves building and managing, tower defense style games and racing. And so they've come up with four different Lego Fusion games to fit those categories. Lego Fusion Town Master lets you create a miniature Lego city, Lego Fusion Battle Towers puts you in a medieval battle where you'll need the best castle and fighters, and Lego Fusion Create & Race has you creating a customized car for either a time-based race or a demolition derby. The fourth game, Lego Fusion Resort Designer, is very similar to Town Master except that it lets you decorate the interior of buildings as well. Each Lego Fusion set consists of 200 bricks along with a special "capture" brick building plate that's meant to be paired with a corresponding app. To play the Town Master game, for example, you would build a two-dimensional facade on the base plate, say the front of a house with a door, two windows and a roof (buildings can be up to 16 bricks high and 16 bricks wide). You'd then launch the app's camera function to focus on the printed pattern, which is used as an identification tag. This essentially lets the app figure out exactly the size and colors of the Lego bricks you've built on the plate, enabling it to import and translate that physical creation into the digital realm. The app is then intelligent enough to transform the two-dimensional front of a house into a three-dimensional virtual building to be placed in the game. Lego tells us it uses Qualcomm's Vuforia mobile vision platform for this process. "For most kids, if you simply give them a pile of bricks and tell them to build something, they go blank," says Pedersen. By pairing a game objective with the bricks, it gives them a prompt to actually get something started. "The games are used to facilitate creativity," she says. All the apps are free to download and experience for free so kids (and their parents, of course) can familiarize themselves with the game's mechanics and requirements before committing to it. However, all of these apps do actually require the physical Lego set to progress. You can't build a building in the game without those physical bricks. Additionally, the Lego Fusion games are designed to encourage kids to keep on building beyond the initial steps. With Town Master, you're constantly given missions to appease the townspeople and run the city. In Battle Towers, you'll have to upgrade your castle with defenses depending on the kinds of enemies the game pits against you. As for the racing game, well, you can't beat your last time or destroy your competition without making your car sleeker and meaner. "It drives kids back and forth from the tablet to brick building," explains Pedersen. Further, since all the creations are stored digitally in the Lego world -- you can save them to the cloud with a Lego ID -- children are able to carry on with the game even after they've put their bricks away for the day. If the parents allow it, kids can connect with their friends using their Lego credentials too. They can visit each other's towns, see how the other person's tower looks like and even race those cars against each other. It also presents the opportunity for the child to learn from what their friends have made, and perhaps improve upon their creations. Each of the Lego Fusion sets cost $34.99 and will be available at Toys R Us, Lego stores and Legoland locations in the US and online. The Town Master, Battle Towers and Create & Race kits will be ready in August, while the Resort Designer game will be in stores in September. The age range for these Lego Fusion games are 7 and up. Though the system doesn't look quite as cool as Mindstorms, at least it encourages kids to build something real rather than poking at pixels all day.